In Pipeliner, the basic data form is the account. Pipeliner presents numerous different views for accounts, as it does for other elements: Compact View, Pipeline View, Bubble Chart View, Card View, and List View. The most convenient way to see everything for one account is the Compact View. In Accounts, the Compact View displays all the important data about that account. Part of this data is all of the contacts associated with that account. Within the Accounts Compact View, you can see that account’s latest activities—the vital day-to-day operations of salespeople. You can also see activities in Account screens. 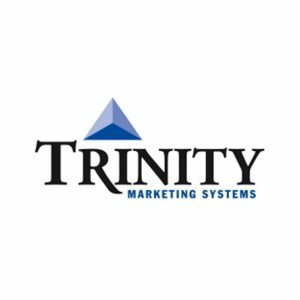 In addition, you can see the business metrics overview of leads, opportunities, account hierarchy, contacts, activities, and notes. The Feeds section of the screen is where the latest communication information for that account can be seen: email, phone notes, and social media posts. Feeds also contains an internal messaging system so that you can instantly communicate with other team members. The Pipeline View visually shows you exactly where all of your live opportunities are situated within your sales pipeline. Simply drag-and-drop opportunities from one sales stage to the next. Hover over an opportunity to see its Card View, and drill down from the Card View see full data on the account. 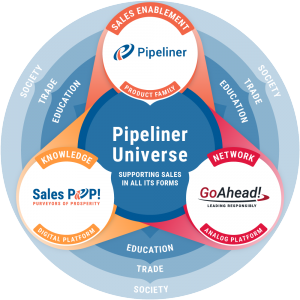 Sales pipeline stages run up the left-hand side. The timeline runs from left to right, and the size of the deal is expressed in the size of the “bubble.” Simply mouseover or click on a bubble for a closer view of that deal. The List View gives you a list of all your accounts in column/row format, easy and totally customizable for your particular needs. It can happen that 2 accounts can be entered into Pipeliner, and at a later time discovered to be the same account. Pipeliner makes it easy to handle such a situation with its Merge Accounts feature—2 such accounts can be quickly merged, with no data lost. We also provide a Bulk Update feature, when fields in numerous accounts or contacts must all be updated with the same data. Instead of having to go through and update each one singly, Bulk Update allows you to update all of them at once. In addition to just listing them out, Pipeliner makes unique use of an account’s contacts. From the account screen, you have access to the Org Chart. Building an Org Chart is as simple as just selecting the Contacts associated with the Account, and then assigning and arranging them according to where they sit in the organization and who they report to. With our Parent Account feature, you can assign a parent account to an existing account—for example, XYZ Company could be assigned as a parent account to ABC Company. This feature also allows the assignment of multiple accounts under one account. 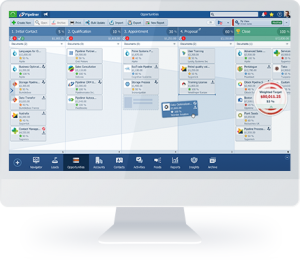 This relationship can also be shown in the Org Chart—and Pipeliner is the only CRM to offer such functionality visually. Instantly import your Contacts from the Smart Org Chart into the Buying Center, and arrange them so that you can see who is influencing the purchase, and from where. You can also add in other Contacts, not usually associated with the Account—such as consultants or others the buyer listens to—that may not show up in the company hierarchy. 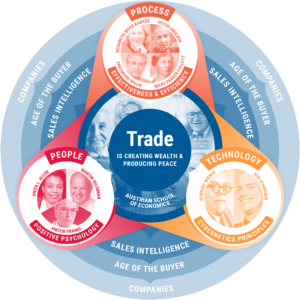 You now have instant visual relationship maps of both hierarchy and buying influence within your prospect company.